Recommended to: Readers who love vampires, witches, or a mixture of the two. How to describe my feelings for this book without spoiling it? For me, the highest compliment I can give Crave is that it kept me reading until the last page. Which is good. However by the time I got there I wondered how I really felt about the book overall. It didn't wow me. I didn't dislike it. My feelings for this book fall somewhere smack dab in the middle. 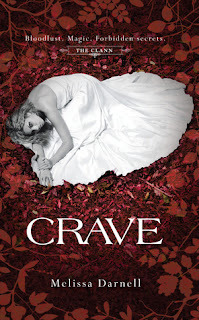 Crave was interesting in some aspects, but let's just say that there's really nothing new being brought to the party here. I liked Savannah okay, but I honestly didn't connect with her as much as I would have liked to. The book kind of rambles on about her day to day life, and there wasn't much to help me link to her as an actual person. Tristan also was just so for me, although I liked him a little more since he actually had quite a sense of humor. In fact, my favorite person in the book was the best friend. Anne. She really didn't even play that big of a role, but she had the most vivid personality to me, and therefore I liked her the best. If I'm telling the truth, it was just the very cookie cutter way that this story was set up that made me so on the fence about it. I'd liken it to going into any animated Disney movie. You know the characters will be different, and there might be a slight twist or two, but overall the story will generally follow the same outline. That's Crave in a nutshell. Girl meets boy, girl is not supposed to be with boy, girl tries to stay away, boy and girl end up together, bad things ensue, crazy cliffhanger ending. Cut and dry. Crave isn't badly written, it isn't slow, it's just something I've already seen multiple times. I think what kept me reading above all else is the way that Melissa Darnell weaves older paranormal lore into her story, but gives it a twist now and then. It was those small twists that gave me hope. I found myself more interested in the background of the people that lived in the city than in the actual main characters and their story. My hope for the next book, because yes this is a series, is that I might get to see a little bit more into the history surrounding these people and their talents. Also since we've been introduced to everyone, perhaps there will be a little more action. So yes, although this book didn't wow me like I wish it did, I'll keep reading on. The ending definitely leaves room open for the next installment, and I'll be excited to see where Darnell takes things next. If you enjoy books that center around paranormal aspects, and have a romance for the ages, this is something that you'll enjoy.